Ashleigh Plante with her good friend, Silver Angel! Philippe Morin, barn builder, versatile craftsman, and friend. 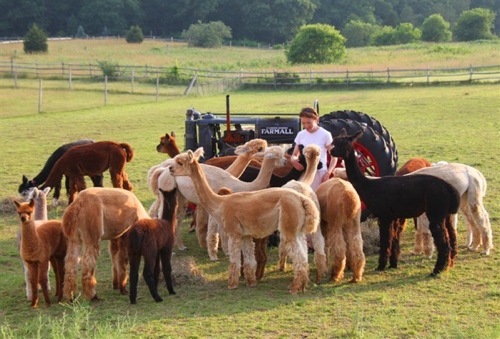 Island Alpaca Company of Martha's Vineyard began in 2004 with the purchase of 19 acres of land and an antique post-and-beam barn that once stood in Export PA. Over the next two years, the barn was assembled, pastures were cleared, and fencing installed. The original purchase of eight alpacas in 2004 had grown to a starter herd of 31, which moved into the barn in 2006. Today, Island Alpaca has a select herd of over 50 colorful Huacaya alpaca. The goal of our breeding program is to produce alpaca with the highest quality fleece, diverse in color, and with excellent conformation. In addition they are chosen for breeding based on their disposition and temperament. 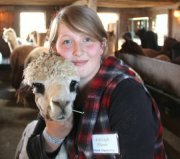 We spend time on a daily basis with our alpaca to ensure that they are easy to handle, safe for children, and fun to be around. Our efforts have been rewarded in the show ring and in our progeny. 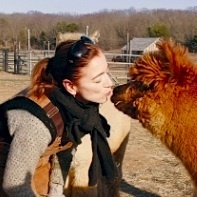 We take pride in sharing our knowledge with those considering alpaca ownership. Sale stock is now available. Our herd is BVD free and all newborn crias are tested after birth. All of our alpaca are registered with the Alpaca Registry, Inc. (ARI). Additional services include boarding and consultation. Your alpacas will receive the same excellent care we show our own: a clean and healthy environment free of external stress: professional monitoring of healthcare and nutritional needs; nearly 15 acres of pasture; and a barn often referred to as the "Alpaca Hilton" by visitors. With the highest standards of alpaca husbandry and the personal attention only a smaller farm can offer, we hope that you will let us share our knowledge and, most importantly, provide the opportunity for you to experience first-hand these delightfully gentle and curious creatures. 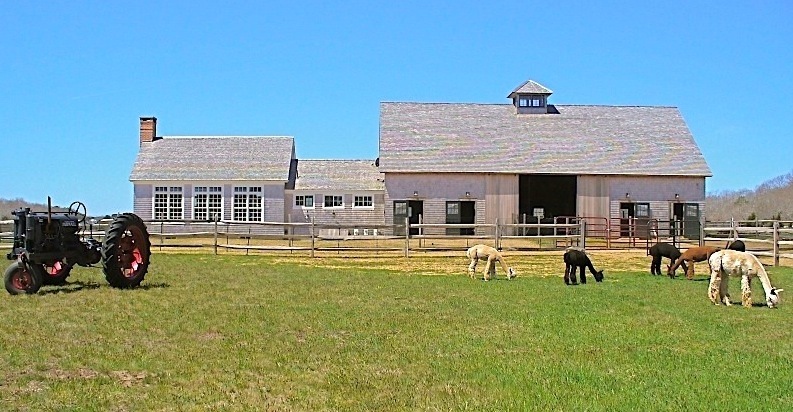 We encourage a visit to our farm on your next trip to Martha's Vineyard to observe the unique Island Alpaca "lifestyle" and to browse our extensive gift shop. Our core staff includes Barbara Ronchetti, owner, Simone Brewer, Rosmarie Jost, Eric DeWitt, Alexi Hughes, Olivia Rogers, and Oliver Danielson. And our course our fabulous summer staff: Rebecca Hodges, Allegra Klien, Lizzi Kass, Peter Koszuta, Samantha Lutschwaunig, Caila Drew Morin, Brenden Morrissey, Olivia Rogers, We are grateful to our volunteers of past and present, including Barbara Dutton, Susan Currier, David and Caleb Hannon. A special thanks to our many talented knitters, in particular my mother, Luise, and sister, Evelyn Ronchetti. There is much talent in the group! 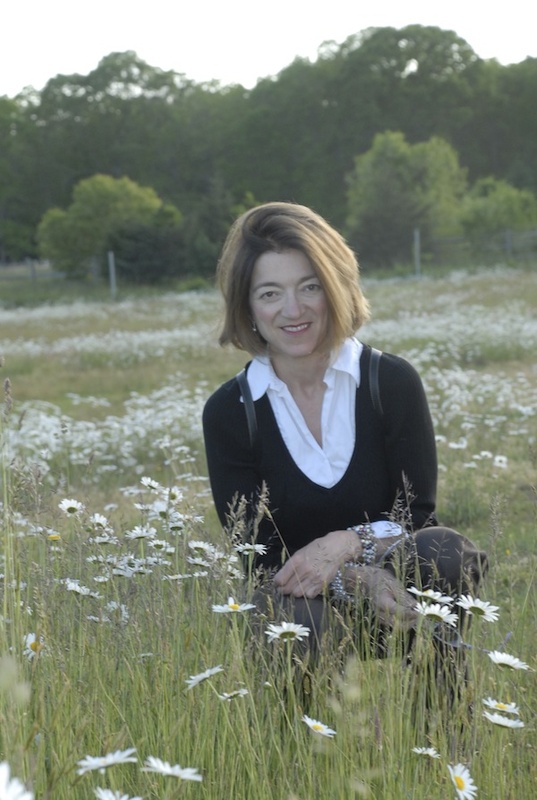 Barbara invites you to visit her lakefront property on Lake Como, Italy, and her extensive website featuring Martha's Vineyard real estate for sale and rental.